Wasn't Kingman gonna release one? got tired of searching for the hole in the heat of battle. did this on my drill press. now I can just crack my thumb screw and I wont be able to rotate the breach the wrong way and slice my detent. I would have loved to do a rounded slot for a ball bearing, but I just dont have the tools. This is hard to accomplish with any gun, but I believe the hammer 7 has an anti double pump feature. I have done this with my nightmare lb just for kicks, and 2 doesn't break, 3 doesn't usually break and 4 always breaks. That said, I think the bore on it is .695. 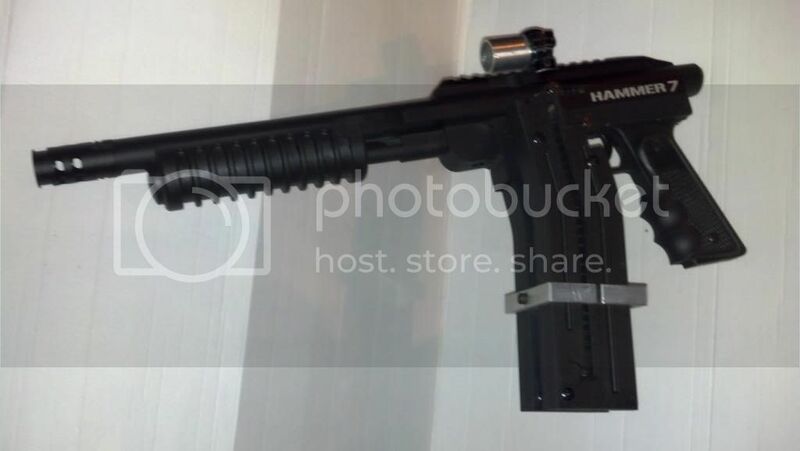 I use to do this with the stock barrel on a Phantom. Most I could get is 4 with no barrel breaks. But 3 broke most reliably on the target. The anti double pump feature is easily tripped. I was able to fire two rounds autotriggering; but like Keebler said, it was a trip in the anti double-pump. Only happened once. I was thinking of this very thing last night; and with the speed wheels becoming popular, a similar grove almost all the way around speed wheel, add a long grub screw sticking up from a threaded hole in the gun protruding into the speed wheel's grove; you could make a wheel that will only turn but once. The whole operation of changing feeds could be done reliably in the dark. Too hell with the gov't and there want to ban high cap mags...I will simply make larger cap clamps!